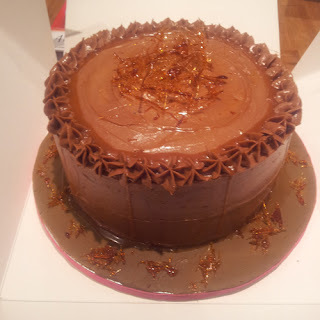 I have had lots of requests for the recipe for my chocolate salted caramel cake that I submitted in the Clandestine Cake Club Competition at the Cake and Bake Show in Manchester just over a week ago. Thankfully I had photographed the making of the cake previously as I had thought about blogging about it. 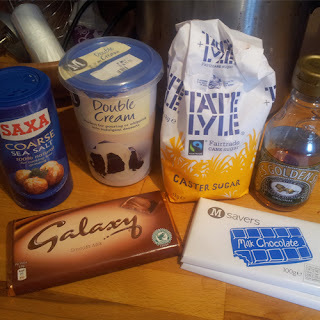 The chocolate sponge is a recipe I was given by my employer during my placement year at university but I have changed it a bit to suit my tastebuds. The recipe was given to me in cups but I've just never gotten round to converting it into weight. If you don't have any measuring cups all the major supermarkets sell them with their baking equipment. 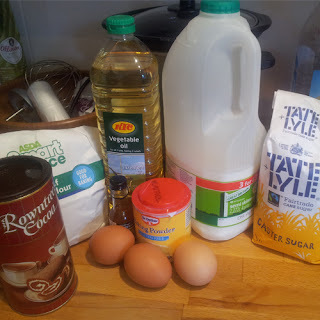 I have found this cake recipe is now my go to for chocolate cake. 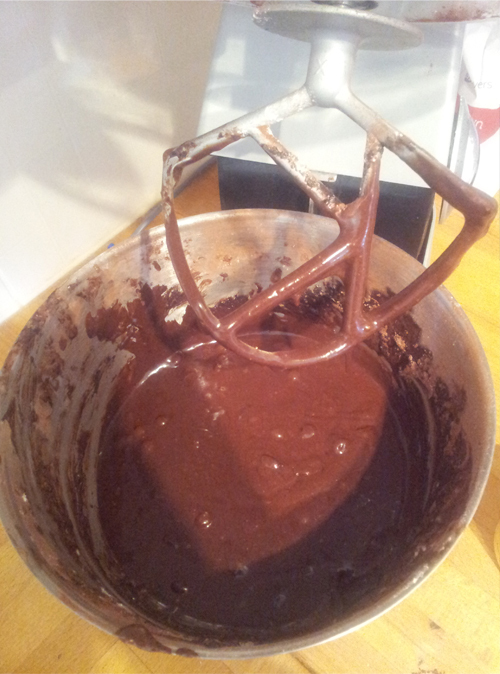 It's so easy and you just throw it all in a bowl and whisk. 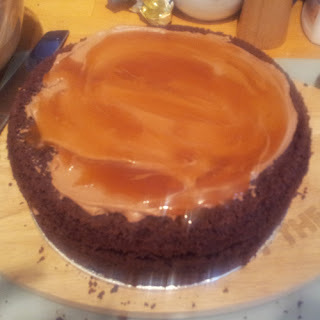 The chocolate salted caramel is an adaption of Edd Kimbers recipe for his Sweet and Salty Cake but once again I have changed the recipe to suit my taste. Firstly preheat your oven to 160c if its fan assisted. Im guessing its 180c if its non-fan and to be honest I have no idea of the gas equivalent sorry! 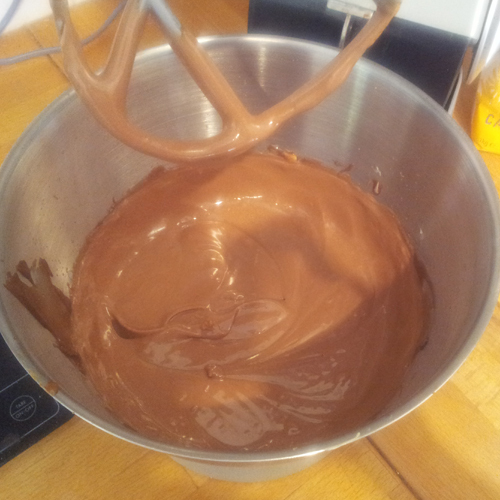 Once smooth divide the mixture between the tins and bake in the oven for 20-25 mins. This time can vary depending on your oven. Now you can make a start on your salted caramel and the chocolate caramel ganache. Honestly making caramel is easy, trust me! Just make sure you invest in a sugar thermometer. I think I paid about £3 for mine off ebay and I now need to replace it cos I broke it by throwing it in the sink after I finished making the caramel for the cake comp. 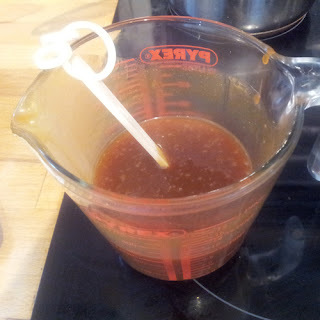 In a deep, heavy bottomed pan add the water, sugar and golden syrup. 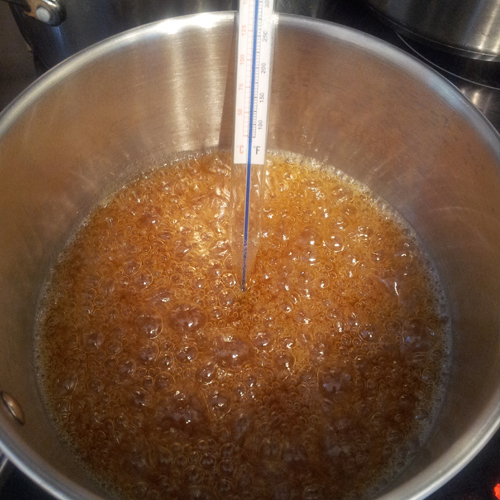 Stir until combined and then boil over a medium heat until the temperature reaches 170C on a sugar thermometer. Once it reaches that temp take it off the heat immediately. Don't just turn off the ring, put the pan on an unused ring on the cooker. 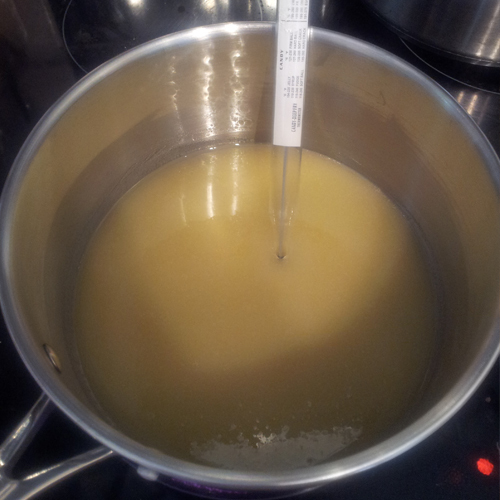 While that pan is boiling away gently heat the cream until its warm but not bubbling. Make sure you stir it cos it will burn and you will end up with nasty black burnt bits in your cream. So once the sugar mix has reached 170 pour the cream into the pan but take care as it is VERY hot and will bubble up for a few seconds. Keep stirring until its all combined and you will have a yummy looking but very hot pan of caramel. Now pour all the mixture into a measuring jug and then pour half of that back into the pan. Add the chocolate into the mix in the pan and stir until the chocolate melts. 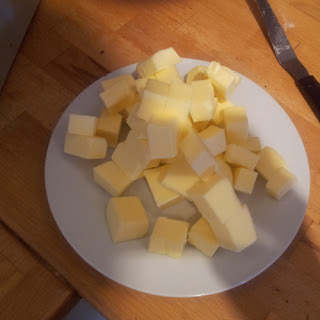 Now if you have a mixer pour this into the bowl, start whisking on a low speed and add the butter to it. Turn up the speed and keep mixing until the bowl is cool to the touch. 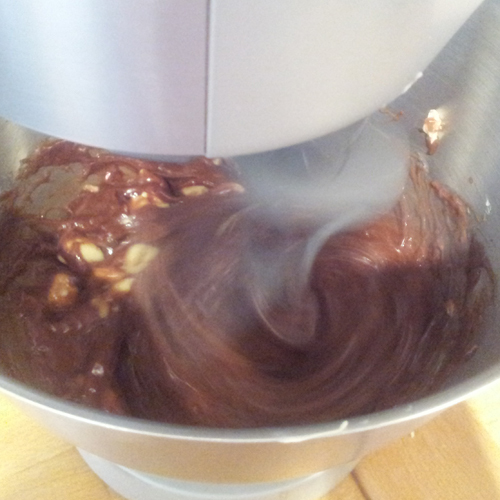 This can take 5-10mins but don't leave it unattended incase your mixer decides to move across the counter. Now if you don't have a mixer you will need to do all of this with an electric whisk, so your arms might be a wee bit tired by the end. I've just realised I have forgotten about the cake. Now your timer has probably gone off while the mixer is doing its thing so pop the cakes out of their tins and onto a wire rack to cool. Chocolate caramel ganche - heaven! Now go have a well earned cup of tea! 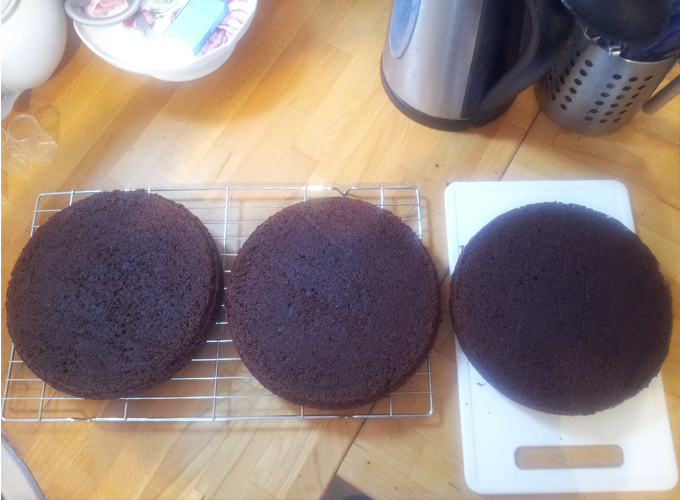 30mins later hopefully the cakes are cool but if not just leave them a bit longer. 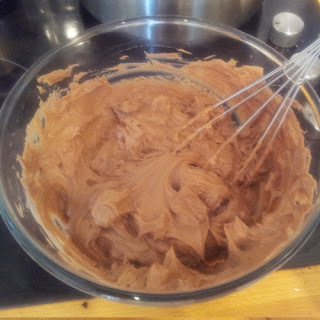 Now take the caramel ganache out of the fridge and give it a quick whisk. Don't leave it in there any more that 30mins or it will go too hard. Once the sponge and caramel are cool you can start assembling the cake. 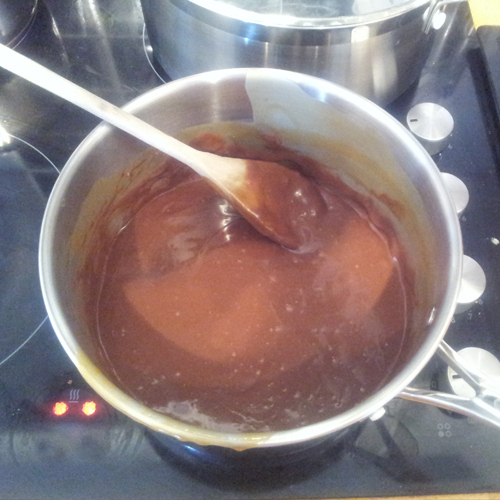 Spread a nice amount of ganache ontop of the first layer then add the salted caramel. Repeat this process for the next layer then cover the cake in the remaining ganache and drizzle over more salted caramel. Chill the cake for about 30mins and then enjoy a nice slice, you have earned it!